I am going to go against my own rule here and talk about religion. Wait, you might say “Why religion when the headline says ‘evolution'”. And herein lies the crux. In most other countries – at least Western countries – talking evolution would be talking science. Not here. Evolution is religion, or the absence thereof. Any conversation about evolution is a conversation about religion. Like it or not. I don’t – but that doesn’t change a thing. Let’s start with the language. People here “believe” in evolution – or not. That isn’t a scientific statement, that is a religious statement. Even the questions in polls often promote that interpretation as they ask people about their beliefs – creationism, theistic evolution (evolution with God running the show), or naturalistic evolution (Darwinian evolution, no God). That is not a scientific question but a religious one. Nobody would think of asking people whether they believe in DNA or the speed of light. More sobering even are the numbers that you get in these polls. Depending on who asks what question of whom and when the numbers come out slightly differently but the fact remains: 60 -70% of the population in this country does not “believe” in “naturalistic evolution”, another bunch doesn’t want to answer the question or doesn’t know what to answer which leaves around 15% of the population “believing” in evolution. Just for comparison: those numbers are well into the 70s and 80s in many other Western countries. 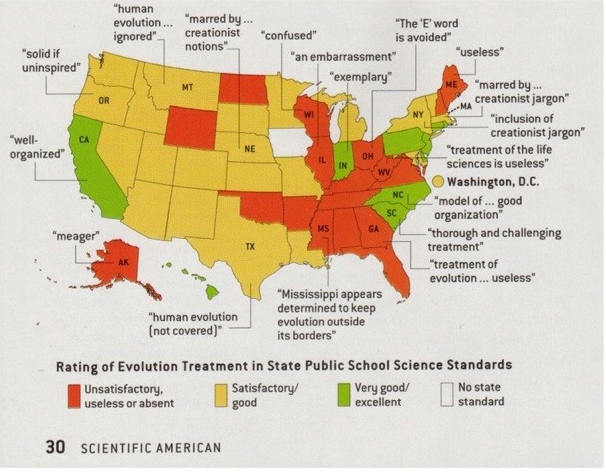 So, when in the US, never assume that a) you are discussing science when you talk about evolution and b) that people will even agree on the basics – that evolution even exists.